With the new family of G-Technology Thunderbolt 3 devices, you get high capacity, fast data transfers, and the ability to daisy-chain up to five additional devices for lightning-fast output through a single port. Combined with Enterprise-class 7200RPM hard drives and a 5-year limited warranty, you get reliable storage that saves time at every stage of your workflow. 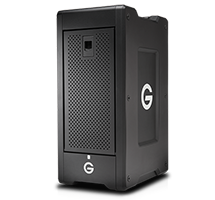 Equipped with Thunderbolt 3 and USB-C ports in a stackable, all-aluminum enclosure, the G-DRIVE with Thunderbolt 3 is perfect for the vital high-performance photo and video editing applications your work requires. Featuring dual removable 7200RPM Enterprise-class hard drives with Thunderbolt 3, USB-C and HDMI ports, the G-RAID with Thunderbolt 3 provides flexibility for demanding video editing applications with performance to support multi-stream workflows.